The robots are coming; banking jobs will be wiped out! That would be the simple conclusion from recent headlines. See: ex Citi CEO Pandit, Cryan at DB, Ermotti at UBS. This week’s post is a more nuanced analysis of what is going on. It is inspired by two things: firstly, a wonderful presentation by Michael Henry of KPMG on the use of digital labour and secondly, by an anecdote from the founder of Swatch, Nicolas Hayek, who in the early 80s rescued the Swiss watch industry. Banks are struggling to make as much profit as they have in the past. Part of this is pressure on the revenue side, for example clients are less willing to pay high fees for poor performance. Part of this is on the cost side; regulations are a costly burden. Together, they mean that banks and bankers are not outperforming other sectors. One indicator helps to make this clear; a recent article in the Swiss monthly, Bilanz (see: “Hurra wir leben noch”, 0/2017) cited a 25% decrease in productivity from 2007 to 2014. And, yes, jobs are disappearing. The Bilanz article cited an 8% decline in banking jobs in Switzerland from 2008 to 2016 of just under 1% per year. I believe there are three inter-related issues which the banks have to manage: first, the labour content, how much work it takes to do something in banking, second the cost of labour, and third the frictional costs go how the banks do business. Swatch made its fame & fortune doing something very un-Swiss; selling cheap plastic watches that were actually made in Switzerland. Cheap and Switzerland are two words you do not expect to see in the same sentence. I remember seeing an interview with Hayek and him being challenged to explain how Swatch could afford to produce, or at least do final assembly, in Switzerland with its high wage costs. His reply was educational. He said that if the labour content was around 10% to 15% of the costs, then the wage level was not so significant and Swatch could afford to pay for the “Made in Switzerland” label. What has that got to do with banking? Banks have poor processes which are too manually intensive. 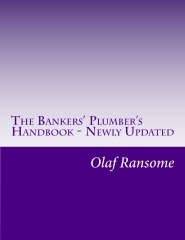 Historically, the banks have made enough profit to offset these fundamental weaknesses. Economists refer to this as “super-normal profit”. In his presentation, Michael Henry cites an example of a commercial bank’s KYC work; historically the average time was 13 hours per instance. Michael and his team were able to introduce digital labour, which included RPA, Robotic Process Automation & Natural Language Processing. Time reduction 75%. Quality was high; machines are far more adept at dealing with the tedious routine of reading through unstructured multi-page documents. Experts will still be needed for exceptions. Besides that, experts will be needed to understand the rules and programme the systems. Those big bank CEOs are right to some degree: there will be fewer jobs, but more interesting ones. If you bring in more money, you can pay yourself more. Simples. England’s Premier League footballers have understood this and grabbed as much of the ever increasing football revenue cake as they can. Bankers are often very well and better paid than those in most other sectors. The Bilanz article cited above puts the Swiss bankers an average 50% ahead of the national averages. The gaps narrow as you move down the ranks. Importantly though, the pay gap is less significant than the productivity gap. Just reducing the number of people will not help you if you have poor processes. Outsource and offshore have been standard approaches to achieving cost savings in banking for the last 20 years or more. Those measures have not been universally successful. My simple view is the product of my observations on banks’ poor processes; banks outsource chaotically poor processes and get optically cheap chaos. “Optically” meaning the business case says it is cheaper., although that might to be the case in the final analysis. As soon as there are multiple locations, there is a lot of liaison effort and travel costs. Then there is the impact on the team in the home country; before outsourcing there were a range of skills, allowing for some promotion and seniority and enough of a team size to deal with the reality of sickness, holidays and turnover. There was also proximity, which reduced response and planning times. That gets lost when work is broken up. In 1994, Goldman Sachs had a very bad year. A certain Jon Corzine, then in charge of fixed income trading, made some bets that lost big. The partners started on a cost-saving blitz. The then Co-head of Operations, Lee Vance, came up with what he thought was a brilliant plan for our seven person Zurich settlements team. Sack one, take three jobs to London and leave three in Zurich. I was very blunt with Lee with my view on how poor his plan was; first, he was not thinking about liaison costs, second with a team of three I pointed out that it would be very hard to attract quality staff and we would constantly have capacity issues. Fortunately, he relented and just as fortunately, I kept my job and the team. As outsourcing and offshoring have taken route, other problems have surfaced. In recent months, two of my friends who are involved in sourcing at a G-SIB have commented that they have found cases where they are being charged for over 100 offshore and outsourced heads that they could account for. Banking jobs will both change and disappear. They need to because the processes are so poor they damage profits. Investors will allocate their money elsewhere. Banks need to help themselves on this journey. Even though there is huge pressure on margins, they need to invest smartly to do more than the regulatory must do stuff and in dealing with that must do pile, they need to really focus on doing more than just nought to get a tick in the box. A\recent webinar from DerivSource: Client Lifecycle Management: Time to Think End-to end From Prospecting to Off Boarding, provides an illuminating data point. A survey of participants said that 50% of participants saw the main driver of their work on client lifecycle management being regulatory driven, vs. 35% were driven by a desire to improve client management and 15% by a desire to improve data management. In my opinion, real success will only come to those who focus on all three. Better data is the basis for better processes. And if the processes are better, there is less of a case to have jobs offshore. And, if the profit margins shrink, then expect to see the current wage premium for bankers over everybody else revert to the mean.